The city will no longer ask community boards for approval of speed bumps, Streetsblog has learned. File photo: Noah Kazis. Community boards will no longer be a speed bump on speed bumps. The Department of Transportation has told the local panels that it will no longer seek their support in placing speed-reducing bumps or humps on roadways. Instead, community boards “will be informed” after the city has “studied, scheduled and approved” the location for a speed bump. Garcia’s letter will be seen as a bombshell in neighborhoods whose community boards have resisted DOT street safety improvements such as protected bike lanes and speed bumps — indeed, Community Board 3 tweeted that it might “set a dangerous precedent … to exclude the board” from other issues. ..if you feel that excluding @communityboard3 from this process will set a dangerous precedent that @NYC_DOT (and possibly other city agencies) will use to exclude the board from other support provisions, please tweet at them your thoughts and feelings on the issue. #ThankYou! 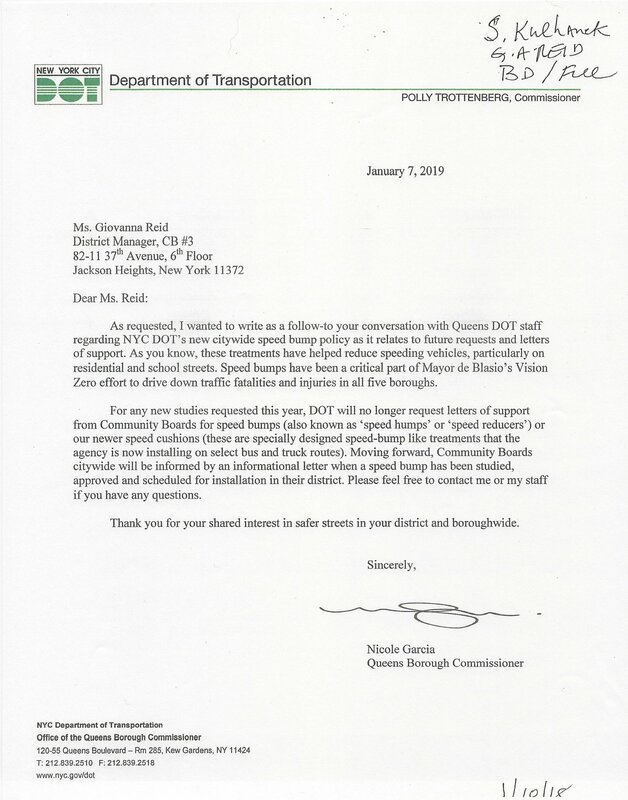 On the other hand, Garcia’s letter reflects a growing frustration among advocates both inside and outside city government that the Department of Transportation is too conciliatory towards community boards, which frequently defer to older car owners in arguments over basic street improvements for all roadway users. For instance, a safer road design might have saved the life of Skylar Perkins, the 1-year-old who was run down on a Community Board 3 street in 2017. And last year, the agency became bogged down in months of debates with Queens Community Board 2 over a pair of protected bike lanes in Sunnyside — lanes that the community board initially requested, then opposed in what Streetsblog described at the time as a show of “ignorance.” The design for the lanes, along Skillman and 43rd avenues, is, after all, identical to other protected bike lanes that have been successfully installed across the city, yet the DOT still sought board approval. Delays in installing proposed bike lanes may have been one reason why the city failed to complete its ambitious plan for 29 miles of protected bike lanes last year, installing only 16-plus miles (20.9 if you believe the official DOT count). Garcia’s Jan. 7 letter does not mention bike lanes, which remain needlessly controversial in many neighborhoods. A group of 14th Street-area landowners, for example, is threatening to sue the city partly over its installation of paired buffered bike lanes on 12th and 13th streets. And some residents of Morris Park in the Bronx also claim they will sue to block a street safety improvement along the neighborhood’s main commercial spine — despite dozens of crashes there. The city is under court order to make streets safer once it becomes aware of a danger. That court order is one reason the city made substantial improvements to Gerritsen Avenue, where four people were killed between 2007 and 2016. Those street-safety changes were attacked by former State Senator Marty Golden, who ended up losing his bid for re-election to a street safety advocate — an indication that residents increasingly want more protections for pedestrians and cyclists, even if the old guard does not. For this reason, Transportation Alternatives has been pushing a plan called “Vision Zero Design Standards” that would require the city to make safety improvements whenever a given roadway is repaved. The bill, Intro 322, already has veto-proof support in the City Council, with 36 Council Members having signed on. The group’s interim co-director said he agreed with the substance of Garcia’s letter. “We encourage community engagement and notification by DOT of street safety improvements, but proven life-saving street treatments should be applied as a matter-of-fact throughout the city,” TA’s Marco Conner told Streetsblog. “Just as with cholera-preventing sewage systems and energy-providing electricity, life-saving road diets — including speed bumps, sidewalks and protected bike lanes, should never be denied any community in our city, and their implementation should be accelerated. DOT continues to prioritize implementing safety improvements, including speed humps, in locations where they make sense. Feedback from community boards remains important to us, along with other outreach efforts, to help provide local input and information that may not be available through data analysis alone. DOT remains committed to a full community engagement process as part of all the work that we do. With respect to speed humps, DOT’s current policy is to analyze where installing a speed hump would be beneficial to safety and where it is physically feasible to do so, and to notify community boards of any approved locations for installations. This policy was updated in 2018 to reduce the effect of different neighborhoods in the city receiving different outcomes. Community Board 3 did not return a call from Streetsblog. This is now Queens Borough Commissioner Nicole Garcia broke the news to Community Board 3. I wish the DOT would no longer seek “Community” Board (aka Local Political Appointee Board) approval of bike lane and would instead do as they will with speed humps and inform the “community” boards (with the specified amount of advance warning required by a local city council law). Just curious, what is the general argument against speed bumps? The typical complaint is that they slow down emergency responders.